Learn to set up, defend, and attack computer networks. 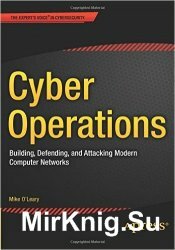 This book focuses on networks and real attacks, offers extensive coverage of offensive and defensive techniques, and is supported by a rich collection of exercises and resources. You'll learn how to configure your network from the ground up, starting by setting up your virtual test environment with basics like DNS and active directory, through common network services, and ending with complex web applications involving web servers and backend databases. Key defensive techniques are integrated throughout the exposition. You will develop situational awareness of your network and will build a complete defensive infrastructure—including log servers, network firewalls, web application firewalls, and intrusion detection systems. Of course, you cannot truly understand how to defend a network if you do not know how to attack it, so you will attack your test systems in a variety of ways beginning with elementary attacks against browsers through privilege escalation to a domain administrator, or attacks against simple network servers through the compromise of a defended e-commerce site. The author, who has coached his university’s cyber defense team three times to the finals of the National Collegiate Cyber Defense Competition, provides a practical, hands-on approach to cyber security.